Honda's Acura Integra was a sporty little front wheel drive 2-door hatchback that won over the hearts and minds of secretaries and Paul Walker wannabes the world over near the turn of the millenium. When they decided to release the Type-R version for sale in North America however, we got to sample a taste of pure Honda driving experience distilled into their most capable (for the time) package. It featured a 195 hp 1.8L B18C5 engine for a downright impressive, naturally aspirated 108 hp/liter specific output. The chassis was lightened and stiffened, unnecessary frippery was binned, and the handling was dialed up to 11 for near-1g performance in the skidpad. These days most of them have been "modded" to oblivion but amazingly, it's still possible to find one with low miles and almost completely stock. 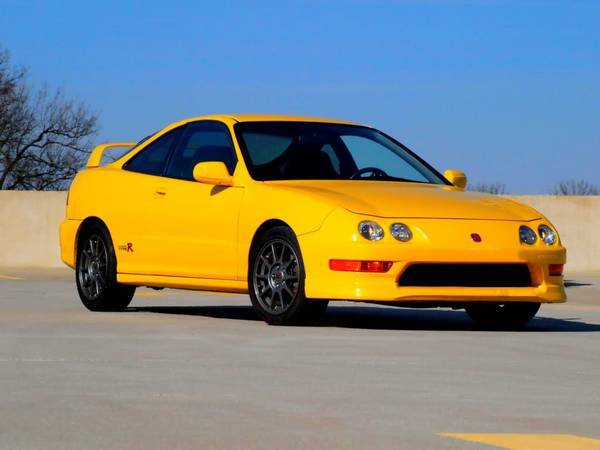 Gaze upon this 40k-mile 2001 Acura Integra Type-R for sale on craigslist in Central Vermont, for $20k or best offer. Thanks to Keenan D. for the tip! 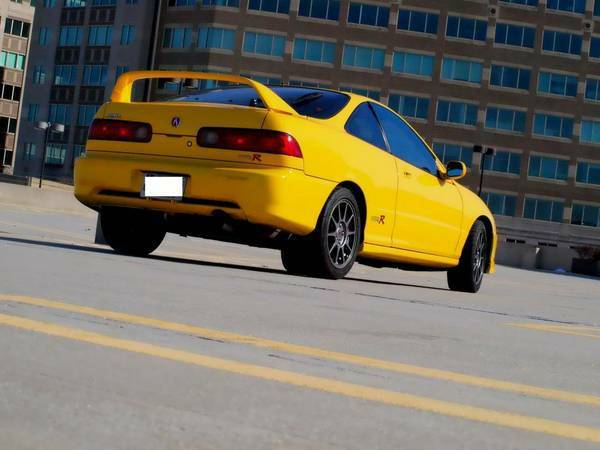 Several years ago Edmunds.com published an awesome comparison between an unearthed 5k-mile Type-R bought by an employee from Acura HQ, and a (then new) 2010 Honda Civic Si. Predictably, on modern tires the Integra won in every qualitative category and surprisingly it bested the Civic in most quantitative measures as well. This car, despite being wrong-wheel drive is a pure embodiment of what we crave here at DT: direct driver involvement, no nonsense, awesome handling, mechanical devices. Machines of pleasure (eeewww...not that kind). Despite the nuclear banana paint job we'd love to have this one in the fleet, for a reminder of what a car can be at its core; no facepod integration, no sat-nav, no flappy paddle gearbox. Just a screaming peaky engine, a 5-spd manual trans and a direct link from your cerebral cortex to the asphalt.